Humanity & Inclusion became the new name of Handicap International’s global network today. 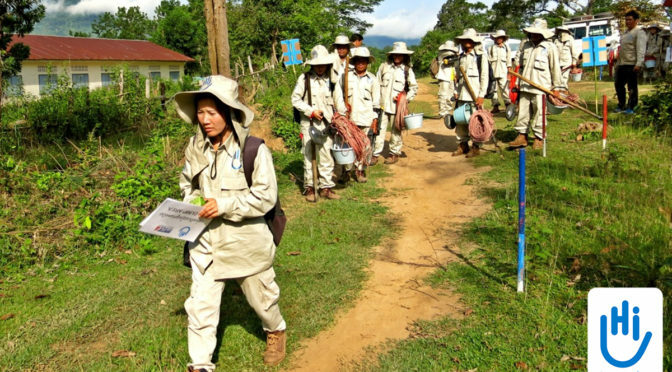 The organization, which shared the 1997 Nobel Peace Prize for its work to ban anti-personnel landmines, implements more than 300 emergency and development projects in about 60 countries per year. ‘Humanity & Inclusion’ expresses one of the organization’s central values, humanity. This is reflected in a benevolent and empathic approach to the organization’s actions, close proximity with its beneficiaries, and a deep respect for each person’s individuality. It means ensuring that everyone has a place in the community while respecting each person’s individuality, and noting that difference is a way to enrich society. Fighting for the inclusion of people with disabilities and against cowardly weapons is a fundamental aspect of the organization’s DNA, which, from now on, will be manifested in this powerful symbol. On its own, ‘Handicap International’ didn’t express the organization’s values and mission. It had become essential to adopt a tagline that was more representative of the diversity of the organization’s actions. The word ‘handicap’ carries a negative connotation that can be seen as pejorative and stigmatizing. Cossette, a Canadian marketing communications agency, won a highly selective international call for tenders in 2016. Cossette enlisted a team of highly qualified professionals from its ranks, including: Natahlie Houde (Vice-president in charge of branding); Barbara Jacques (Director of Creation, Branding & Design); Eve-Marie Boutet (Director, Business Lead) and Charlotte Fabre, (Senior Accounts Manager). The agency relied on a broad consultation in its research to find and test a new identity for HI. More than 1,000 HI employees and voluntary workers completed a closed-ended questionnaire, and more than 350 took part in discussion sessions. The Cossette team visited HI’s program in Iraqi Kurdistan, where it met with about 60 people. Cossette tested proposed names and graphic identities with HI’s target audiences, including private donors, public funding agencies, disability rights leaders, partner organizations, beneficiaries, and staff. The team conducted such tests in 17 countries (Belgium, Cambodia, Canada, Colombia, Ethiopia, France, Germany, Iraq, Jordan, Kenya, Lebanon, Luxembourg, Niger, Switzerland, Syria, the United Kingdom and the United States). Cossette designed the campaign pro bono. Olivier Staub directed the campaign’s film, which was produced by Morrison Films, and Staub also produced the photos for the campaign, all pro bono. The French Canadian actress, Pascale Bussières, and the Canadian singer, Feist, lent their voices to the French and English versions of the film. Globally, Humanity & Inclusion is grateful for the support of a range of ambassadors, including renowned soccer player Neymar Jr, and American pilot Jessica Cox, born without arms and featured in the award-winning documentary, RightFooted. In Canada, Diane Tell and Anthony Lemke serve as spokespeople, while HI Belgium enjoys the support of singer Axelle Red engages regularly with HI. Most social media handles are unchanged. the new logo is good, who is design it? ?